Cover of Missionary Methods: St. Paul's or Ours? 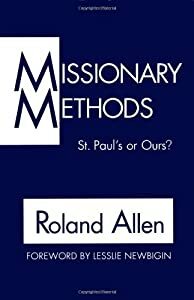 Roland Allen‘s classic book, “Missionary Methods: St. Paul’s or Ours?” is an important book that examines how we do missions. It certainly has good points. If I wanted to be honest about it… the obvious answer to the question of Roland Allen is “Ours”. That is because we always need to tailor our methods to the culture and time we live in. There is no way we should use St. Paul’s methods for missions anymore than we should Hippocrates’ method of medical treatment or Alexander the Great’s method of warfare. However, this is misleading since Roland Allen wasn’t really talking about missionary methods (despite the name). He was talking about principles for mission strategy. I would like to suggest, though, that we focus on the missionary methods (principles) of Barnabbas rather than (or at least in addition to) Paul. There are a few reasons for this. 1. It appears that the major mission strategy was from Barnabbas rather than Paul. Paul appeared to be a disciple of Barnabbas in the early years and the early part of Paul’s first missionary journey appears to show Barnabbas as the leader. This is supported by the fact that the first missionary site sought Jews on the island of Cyprus. Barnabbas was a Jew from Cyprus. After this site was done, they went to southern Turkey to minister to Jews there. Paul was a Jew from this region. This suggests that Barnabbas modeled and Paul imitated at the beginning. 2. Paul’s biggest innovation from a mission method appeared to be his decision to go directly to the emperor of Rome. There is a lot of difference of opinion as to whether this was God’s plan or not. Even Luke described Paul’s determination with a certain level of ambivalence. Regardless, the plan appears to have resulted in little tangible fruit. These first two points are not that important. I certainly don’t wish to downplay Paul’s importance as an apostle, theologian, and writer. I am just suggesting that Barnabbas’ role as a missionary is seriously underestimated. And this brings up a third point. 3. Barnabbas’ determination in developing people is an important aspect in missions. This appeared to be his primary role… thus his nickname– son of encouragement. Missions does not move forward by supermen. It moves by people following Christ’s example of discipling and modeling being a faithful servant. John Maxwell describes 5 levels of influence. The lowest is position (listen to my job because you got to). The next is permission. Next is performance. Then comes people development. The highest is personhood. Personhood is not an uncommon result. However, Barnabbas’ influence was that he believed in people (such as Paul and John Mark) and developed them into being great ministers. John Mark later worked with Paul and Peter, and Paul followed Barnabbas’ pattern as one who disciples others to became great servants of Christ. Missionaries would be wise to look to St. Paul for basic principles in missions, but don’t forget Barnabbas, son of encouragement.